Digital pseudorandom noise is ususally generated using shift registers with feedback by an exclusive-OR gate to the input. The feedback taps have to be chosen in order to create a maximal-length shift register. See Horowitz & Hill The Art of Electronics, chapter 9.32. Let's disregard this for a while and see what we can do. Here is a quick test to find the resonance frequency of a parallel LC circuit . Well, it needs the noise generator and a PC with the good Wavespectra software, so much for the equipment. 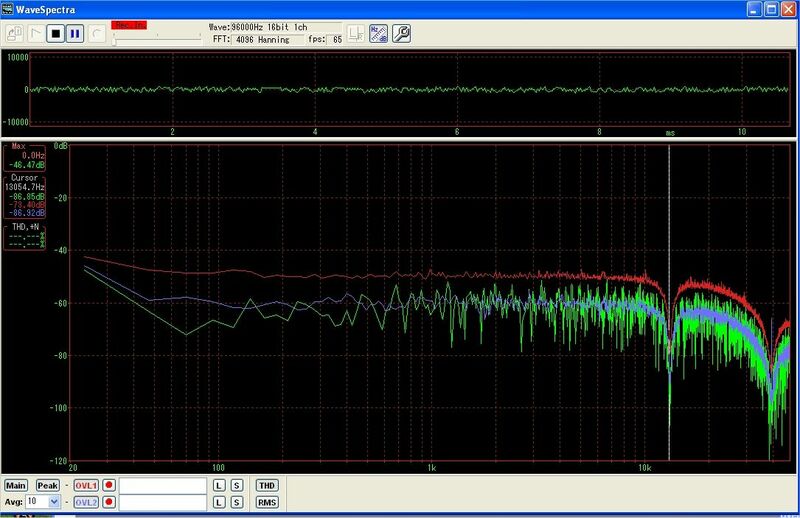 The LC circuit under test is just wired in series between the noise generator and the audio input of the PC. Circuit diagram of the test setup. 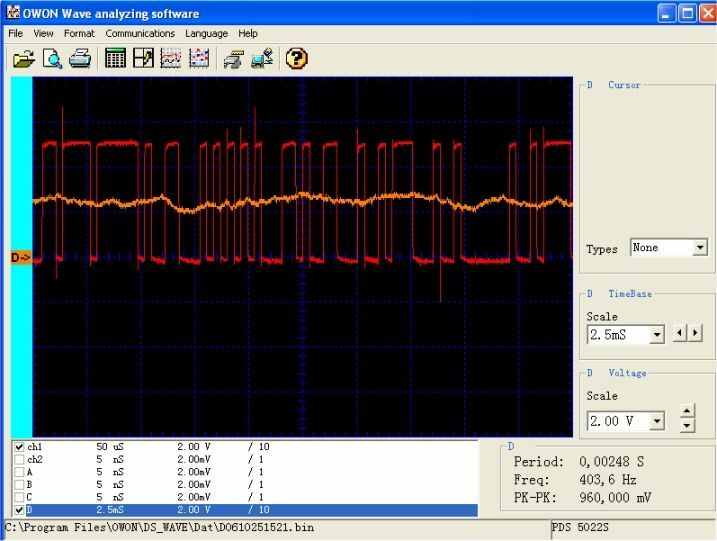 View of a spectrogram of a LC circuit wired in series. 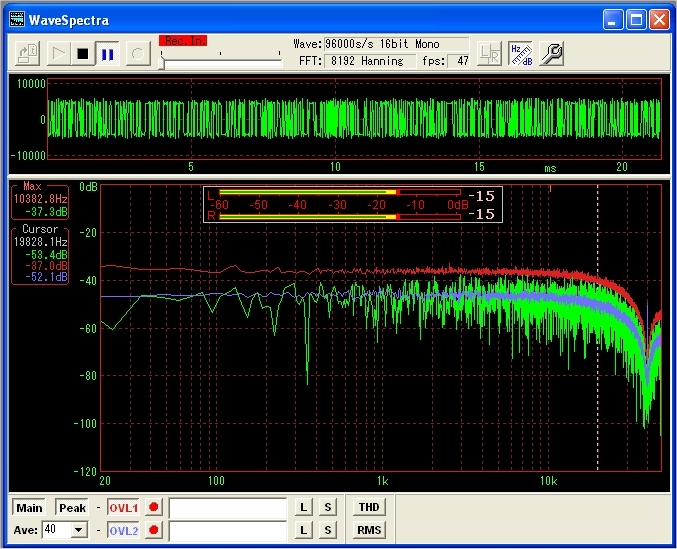 The resonance (a dip in this case) is at 13 kHz. Quick and easy. 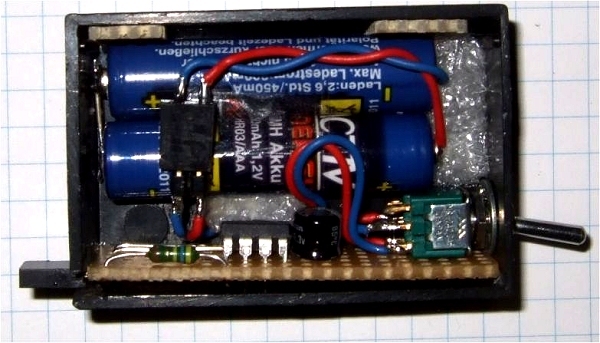 Looks worthwhile to build this noisegenerator. 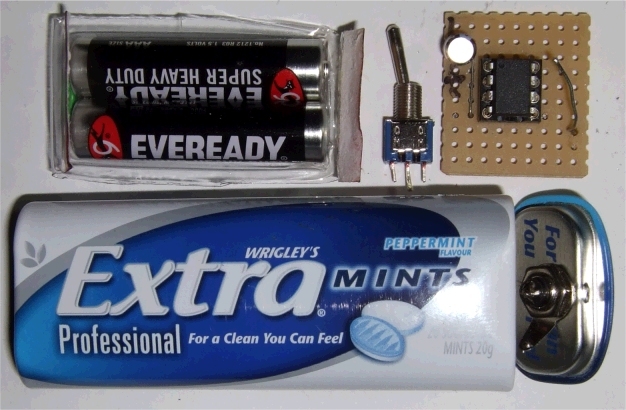 Below is a proposal to put it in a Mints box. These are the parts needed Then comes the tricky assembly, there is just enough space to get all parts in. Finally done. 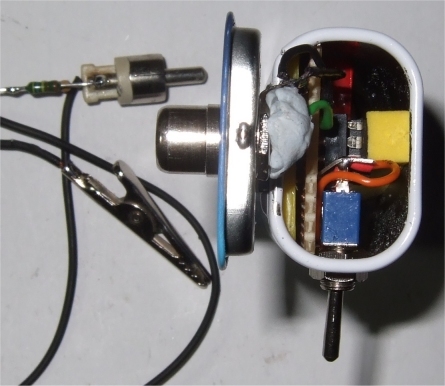 On the output is a fixed resistor voltage divider which serves as a tip to inject the noise. This 39 bit maximal length noise generator repeats every 549,755,813,887 cycles. With a clock of 40000/sec it takes 13743895.35 seconds, or 3817 hours, or 159 days before the cycle repeats. Gives enough time to complete a measurement. 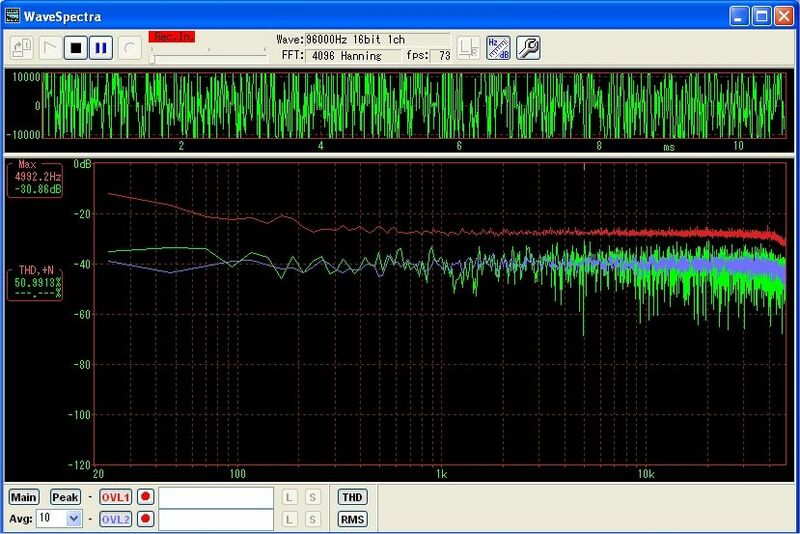 Der noise generator geht auch mit dem AT13 mit dem Vorteil einer höheren Taktfrequenz von 9.6 MHz. Beim AT13 wird die Taktfrequenz per Software umgeschaltet, so dass man die fuses nicht programmieren muss. Die ISR läuft jetzt mit 200 kHz und entsprechend flacher ist das Spektrum bis ca. 40 kHz. Mehr kann die Soundkarte ohnehin nicht. Das Spektrum bei direkter Verbindung zur Soundkarte, also ziemlich flach bis 40 kHz. Mit einem einfachen RC Filter mit R 10k und C 100 nF wird das Rauschsignal gefiltert. 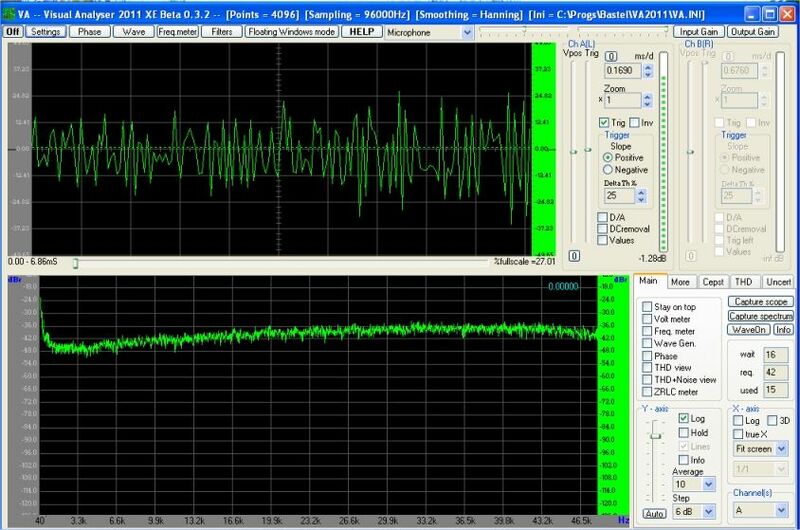 Die Grenzfrequenz ist bei 1/(2 pi R C) etwa 160 Hz. 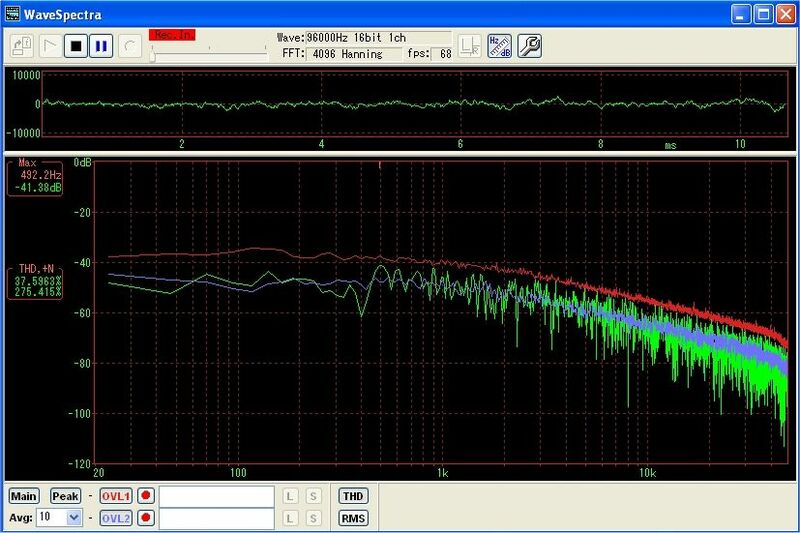 Im Scope sieht man auch ein relativ flaches Signal in der Mitte, das Spektrum aber hat den RC typischen sanften Abfall zu höheren Frequenzen. Die Messung geht sicher schneller als mit einem sweep frequency generator und einem mV meter. ;Shift everyone over, and the carry into the register. ;way longer than the universe. ldi    temp,0b10000000		; turn off analog comp. rjmp	Idle			; That's all we do. ;of the universe, by 1,000,000 times. ; Pseudonoise generator, output on B0. ldi    temp,0b10000000		;turn off analog comp.